So, we have reached the final part in this trilogy of posts reviewing the campsites I stayed at during my tour. Nights 19 to 27 coming up! This was the campsite that I probably saw least of and I shall explain why. Night 19 marked the first night that I encountered rain and it was set to continue throughout the night. So I arrived, checked in with the assistance of a man who was struggling with the receipt-printing machine as it had run out of paper and he was fairly new to the task, and set up the tent. After using the bathroom and running between the car and tent with armfuls of bedding, clothes, food and a couple of books, I finally made it into my waterproof home – at least I hoped it was waterproof (it was). I was happily reading my new book about Scottish lighthouses that I had picked up at the Museum of Scottish Lighthouses when the neighbours arrived home. They had clearly been out drinking because she was gobby and he was aggressive. I was concerned that there would be a case of domestic violence at a few points, but it seemed that she knew how to hold her own against him (some couples are just a bit strange). Eventually they quietened down and, although the rain continued throughout the night, I slept rather well. The facilities at the site were standard, but not as clean as some of the others, which probably wasn’t helped by the weather conditions. The site was located a short distance from the centre of Lochgilpead, which would have been nice had it not been for the weather. Overall a good site, I just wish I’d had the chance to explore a little more. This was probably the most commercialised site I stayed at, but belonging to Park Resorts it was to be expected. I arrived just before 6 to find that reception closed at 5pm (although it said 7pm on the website), but it wasn’t a problem as I wasn just told to wait until 6 when the security staff would arrive and be able to check me in. Although the camping area was rather long it was fairly busy so I had the choice of a dried up area or another dried up area to pitch my tent. It was here that I struggled most to get tent pegs in the ground and had to ask a park attendant to assist me the following morning in pulling them out. There were plenty of facilities available here: bar, amusements, fish and chip shop (took advantage of that one as well), laundry room and a very sparkly toilet block (they had used some sort of material with glittery bits in it on the walls and surfaces – a little weird). So that was good. There were two showers in the ladies bathroom both of which leaked (just what you expect from a large site, surely), but like the site I stayed at on my first night camping their main focus clearly wasn’t tents. My least favourite part of this site was the fact that a train line ran alongside the camping area, which made it a pretty noisy place to be when freight trains passed. So, I don’t suppose I’ll be revisiting any time soon, but the facilities were good. Firstly, this site was not easy to find. There are no directions on the website and I managed to find it on my third attempt after speaking to the owner on the phone a couple of times. Eventually I arrived and found reception on my third attempt too (really wasn’t doing well that day). I checked in and was given a map of where I could camp (which I then, it turned out, went on to ignore). I ended up camping on a pitch that was for those who had paid for electric hook-up only, but luckily the site wasn’t full and when the man came over to tell me that I was in the wrong area he allowed me to stay there anyway as I was only staying a night. Oops! I was quite pleased really as I had an amazing view of Dunskey Castle and the mound where I was supposed to have camped was rather busy (it was just a big mound with no real level ground). The toilet block here was fine, but the location was really the main appeal and I embarked on the lovely walk along the cliff path from the site to the centre of Portpatrick. It was a nice evening and I sneakily went and explored inside Dunskey Castle on my way back. Although it’s a bit out of the way, I would recommend this site for its location mainly. I’d love to go back to area again one day. So, back in England and no more beaches on the seafront for me. This site was fine and served its purpose very well. It was really quiet with, fortunately, a sheltered pitch for me to settle. Finding it did involve me and one of the owners standing silently for a moment trying to work out which way the wind was blowing (it seemed to be coming from all directions). The toilet block on had one shower in the ladies, but I was having a grubby day (partly due to my waking up late after a pretty bad night’s sleep). There were plenty of dogs around and it was only a short walk to the beach. The walk to town to find some food was a little more arduous though and, due to the time of day, there wasn’t much in the way of available food, but I managed by going to the only open cafe where everyone else seemed to be converging. There’s a damn golf course next door, which is fine, but I managed to get a little lost on it on my way back from a lighthouse hunt (not using my sense of direction got me into that and using it got me out – should have stayed focussed at all times). So, there’s not a huge amount more to say about the site. Get’s a fairly laid-back thumbs up. I stopped in the car park of another campsite to phone ahead to this site as I knew it would be a busy time. I loved the name and thought it might be just as lovely as it sounded. It certainly is a good site with lots of facilities (pool, laundry room, kitchen etc.) and has some great little decorative touches. There are plenty of toilets and showers available and the camping area was on level ground. It’s also a really nice location, just a few minutes walk from Duddon Sands and I took a stroll alongside towards Hodbarrow Point in the evening. The only problem I encountered with this site was the noisy neighbours. They were families with children, but it wasn’t the children that were the problem. The adults were drinking until the early hours and playing really loud music, which I’m sure was very fun for them, but not so much for me (did they not know that I was on a driving tour?!). I was also approached by one of the noisy guys who told me I needed another tent peg (although he didn’t use those words, he referred to them as something else so it took me a while to work out what he was chatting about). I assured him that it was fine and he and his friend simmered down after I informed them that I had camped for almost 20 nights without a tent peg in that particular part of the tent. That’ll learn ’em! I would be happy to revisit this site in the future, but hopefully it would be a little quieter! I had slept badly for a few nights and was not able to find a campsite with any availability so I decided that a B&B was the way to go. It was just along the road from this that I narrowly avoided getting three points on my licence (phew) and so I was just glad to arrive. The only issue though was that I couldn’t work out what the house number was. I couldn’t find the number on the website and there didn’t appear to be any signs outside that matched the name I was looking for. Google Maps told me it was number 43, but I think it ended up being 40 something else and on the opposite site of the road. So, I rather embarrassingly had to call the lady from right outside to find out what number it was. Oh well, I made it in eventually and was given a lovely big room. I made myself a cup of tea (so much relief at the presence of the kettle and the lady said to just let her know if I needed any more tea bags – heaven!) and had a brief relax (I’m not good at relaxing, it turns out) before heading back out for a walk along the seafront on the lighthouse hunt. The B&B is in a really convenient location just a short distance from the town centre. The following morning I had a menu of breakfast options to choose from and a room full of memorabilia to look at while they prepared my full English. The breakfast was brilliant and I had a really nice chat with the owners (who also enjoy the odd lighthouse visit). Really liked it here and got a chance to watch a bit of the Jubilee celebrations too. Bonus! This must have been one of the easiest campsites to find based on the instructions online. It has a small camping area and I was the only one in a tent (who knows why, got to do a bit of camping in the rain surely!) It was a really quiet site with plenty of bathroom facilities. The owner was friendly and it was very conveniently located not far from the M53 for my trip to Wales the following day. There’s not a lot else to say about it really, just that it’s a really nice site! It took me a while to find this one, partly because the GPRS on my phone wasn’t working (that was a lifesaver at times) so I sort of guessed where it was and then realised I gone too far and stopped to check the instructions. There aren’t many buildings in the area so it shouldn’t have been too difficult, but I struggled (as I do sometimes). Anyway, I found it eventually and met the lovely owners. I was welcomed by two dogs, the smallest of which was a little chatty and I was later told that, as I was the 1,001st visitor, I got to take the dog (not sure the male owner was that keen on the small dog!). The site is fairly new and was pretty quiet when I was there, although the weather again wasn’t great. The bathroom facilities were good and kept very clean. So clean, in fact, that I felt really guilty for going in there after I had been traipsing around on the muddy grass outside. I pitched my tent in a spot where I would be sheltered by a touring van and a short distance from a field of ponies, which was lovely. The female owner was really chatty and a lovely lady. She stuck her head out of the window the following morning to check how I’d slept and warn me about the weather and parking in Aberystwyth. It’s a really nice location, very far away from anywhere (at least that’s how it felt, but it wasn’t actually too far from Holyhead) with the lovely Trearddur Bay to the east and South Stack lighthouse to the west. Would definitely recommend this one. What can I say about this site except that it was my favourite! I arrived and was given a comprehensive tour of everything the site had to offer, including the Camper’s Cabin. While I pitched my tent they prepared a cup of tea for me and brought it out along with some cake (amazing!). The weather wasn’t great so I tucked myself away in the Cabin for a while until I was joined by the owners and some of their family members. 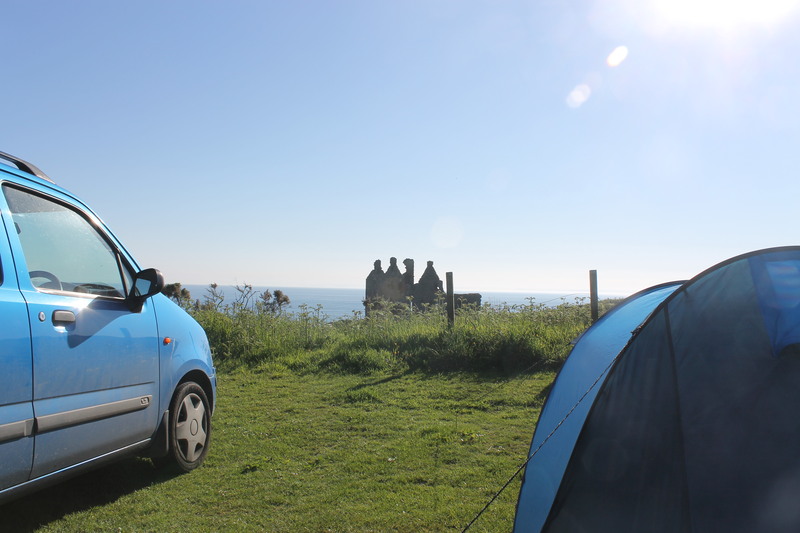 I had a lovely evening with them and received a free full English breakfast the following morning as the owners thought they had overcharged me considering the size of my tent (they clearly weren’t aware that I had paid £20 at the campsite on my first night – now that’s overcharging!) It was a really lovely experience being there and I was made to feel like part of a friendly camping community. The owners also informed me that the outdoor shower block had frozen up at one point the previous year and so they had let one of the campers have a shower in their house, that is how kind they are. I would not only recommend, but positively encourage, people to stay here. It’s a wonderful place and I couldn’t have asked for a better last night of camping.